What Should States Require of An Immigrant to Receive A Driver’s License? Issue of the Week LXX: What Should States Require of An Immigrant to Receive A Driver’s License? Immigrants who are in the United States illegally are often called "undocumented" despite carrying a long list of papers: passports, consular ID cards, birth certificates from their home countries, and those of their children born here. The question remains which documents will constitute a golden ticket for them to be able to apply for long-awaited driver's licenses in the Golden State next year. California officials are trying to strike a balance between having a secure license and making it accessible to immigrants who are currently prohibited from driving. The key is ensuring immigrants prove they are who they claim to be and preventing fraud without making the requirements so onerous that people give up on trying to get a license. "We can't make it too restrictive," said Jan Mendoza, a spokeswoman for the state's Department of Motor Vehicles. "But we have to have the integrity of, this person is who they are and this person lives in California." California has proposed allocating $67 million in next year's budget to issue the licenses. The state plans to open five dedicated offices and hire up to 1,000 temporary workers to process roughly 1.4 million applications expected over the program's first three years, said Lizette Mata, deputy director of special projects at the DMV. California may be the biggest, but it's hardly the first state to grapple with the issue. Eleven states have enacted laws to issue driver's licenses to immigrants in the country illegally, many of them over the last year, according to the National Immigration Law Center. 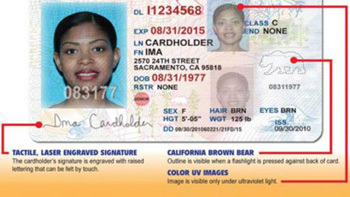 To obtain a license in California, immigrants will have to prove their identity and that they reside in the state, sign an affidavit, and pass written and road tests like other drivers. The licenses will contain a distinct marking and cannot be used as federal identification. Immigrant advocates are urging state officials to keep an open mind on documents that could prove an immigrant's identity, such as foreign driver's licenses or voting cards. Some suggest that immigrants ought to be able to use their children's U.S. birth certificates, school records or baptismal records to demonstrate their own identity. "Because we are dealing with the undocumented population, we want to make sure we have unconventional ways for people to prove their identity," said Ronald Coleman, government affairs manager at the California Immigrant Policy Center. In Illinois, which started issuing the licenses last year, immigrant advocates tried to get documents belonging to the U.S.-born children of immigrants included, but state officials decided against it, said Fred Tsao, policy director at the Illinois Coalition for Immigrant and Refugee Rights. Illinois initially considered requiring immigrants to submit their landlords' contact information to demonstrate residency but backtracked after immigrants feared they could be evicted once their status was disclosed, he said. In California, advocates are worried consulates may not be equipped to handle a deluge of passport applications. Another concern is immigrants who came to the U.S. fleeing violence but who may not have applied for - or qualified for - asylum, and whether they'll feel comfortable going to a government office from the country they left. "As much as I would like the process to be easier, I don't foresee a process that does not require a governmental type of identification," said Martha Arevalo, executive director of the Central American Resource Center in Los Angeles. "I don't see the state going for that." In addition to identity, other states also require immigrants to prove residency through leases, utility bills and other documents to prevent people from crossing state lines to seek a license. In 2006, Tennessee stopped issuing driving documents to immigrants in the country illegally after several cases of fraud showed the cards were heading out of state. Earlier this week, about 200 people attended a workshop in Sacramento to provide input to California on which documents immigrants can and can't readily get. A second workshop is planned for Southern California in February. Maria Eugenia Galvan, a 44-year-old hair stylist from a Los Angeles suburb, said she has a Mexican passport and birth certificate and is ready to apply. But she worries about friends who don't have such papers and may have to get a relative to unearth birth certificates issued years ago in small, remote Mexican villages. Her main concern, however, is price: California officials have yet to decide how much the new licenses will cost, but Galvan can't afford to go without one. "A police officer stopped me one time, and he took my car," Galvan said, adding that she also got cited for not having insurance. "We had to pay $1,200 in fines." It is the first time that I hear about those driver licenses for illegal immigrants. It seems to be a good idea. Doubts about fraud are understandable since Illinois has already stopped its program due to misuse. However, these doubts should not be the decisive reason that this project does not come through. Fraud or misuse can happen anywhere and with any program as people try to take advantage of each other. So, California should give those driver licenses at least a try. The right intention underlies it and that should count in the first place. If people, then, do not esteem this project, one can always stop it all. i agree that the idea should at least be pursued or tried because most were taught as children to not judge a book by it's cover. in this instance it is no different. they should let the actions of those who used it for fraud and misuse prevent the opportunity of those who actually use the licence as intended. today's society views immigrants as something only intending to steal our jobs from us when in actuality they are merely trying to do what we do when we take a job. they are only trying to provide for their families. why should we then deny them their means to get to that job? To me, if someone is in the United States illegally the government should not allow them to hold a job or receive any of the benefits that a citizen gets. Illegal citizens should not be allowed in the country, let alone hold, or take away, any of the rights citizens receive. I agree that if the person who is in united states illegally the government should not allow any benefits to them, but I think it is better for the government to investigate why that person is in united state illegal? because that person might have some reason to do so, and after that is where the government will know how to deal that person rather than delaying some of the requirement like the driver's license. I agree that if the person who is in united states illegally the government should not allow any benefits to them, but I think it is better for the government to investigate why that person is in united state illegal? because that person might have some reason to do so, and after that is where the government will know how to deal that person and I do not think if he or she have the right to get a driver license. But for the legal ones it is better to be given without too much delays. I find this view interesting. I find this view interesting. It can be challenging and costly to become a citizen of the United States. Unless you had to go through leaving your country to become a citizen of a new one I don't think someone should make light of it like it is buying some bread from a store. There also are many different reasons someone may have to flee their home country. Illegal immigrants still have to work and pay taxes like citizens do. They also aren't receiving a helping hand from the government with anything like some American citizens can. Now I believe the idea of the drivers license should be pursued, fraud will be done by illegal immigrants and US citizens with anything. One question that need to be ask is if this project won't be exploited in is initial intention to get track of undocumented people in the US. Answering this is shouldn't matter if these people should get a chance for licences and jobs. It is simply addressing morality in case this project gets through. This is a touchy subject to me. I have known people that may or may not have been in the states illegally, but were still able to obtain the right documents that provided them a job at minimum wage. They were good people. However, I know that is not always the case as it was mentioned about illegals abusing the system in Illinois. My honest view on it is that people who are here illegally, whether they were fleeing from violence or just wanting to try and make a new life, should not be granted such benefits as US citizens receive. I think they need to go through the process to become a citizen first before anything else. There are temporary measures that they have access to to obtain a job and make the money that is required or needed to become a citizen. We all work hard for what we want, and some work harder than others. Being granted a driver's license should require the proper forms of identification for themselves and definitely NOT a birth certificate of a child. I agree with the statement that illegal citizens shouldn't be living in the United States. If someone wants to live here legally they definitely need to go through all the processes like other immigrants have gone through. I'm not sure that i support illegal immigrants getting drivers licenses in the United States, it doesn't seem fair. Illegal citizens, by law do not deserve to receive any of the services or benefits in that particular country, but our moral values require us to treat them with respect and that they have the right to choose where they want to live and earn their living. Perhaps, strict government policies and costly procedures are the reason they dont have all the required papers. I believe that all immigrants who want a driver's license should become citizens before doing so. With citizenship comes rights, including getting a driver's license, voting, and working legally. A state-issued ID is something that everyone should have but should not be available to those unable to prove citizenship. Allowing illegal immigrants licenses grants them incentives for undergoing the immigration process in an improper fashion. This is like giving your dog a treat for sitting when you tell him to play dead. If they are going to be recive a possitive reinforcement a fter they crossed the frontier illegally, Do you think people is not going to consider this illegality as a good option? To me this seems really pointless and I do not think that it is a good idea. This would promote the crime in certain ways. If the person is called an 'illegal' immigrant, would the driver's licenses be illegal? Maybe I am missing something, but I feel as if this is similar to a fake ID with a different age. I do believe it should be easier to immigrants to become legal citizens in the U.S., then they can obtain a normal driver's license. Until then, I don't see how doing this can technically be legal by federal law. That would make sense about documentation and wanting to have some sort of state issued ID but why should someone who moved here illegally and resides here illegally have the privilege of seeming legal? Our society is ruled by laws, which should be followed. If you decide to live in a country that is not the one you were born in, you should follow its law more carefully, specially when it concerns to documentation, no matter if you are a good or a bad person. The main concern here seems to be about which document should be accepted in order to permit a driver's license to be issued in an immigrant's name. The DMV should follow imigration's rules and not issue driver's license for illegal immigrants. It is not only citizens that are allowed to have a driver's license, legal permanent residents are also allowed. I have mine and I am not a american citizen... I am a international student which is legally living here and I have a way to prove that. If you don't have a way to prove that they are in a legal situation, so you can't have that right. I agree that it would not be fair to whoever is legal in the country and do all the right things in order to keep it that way. I agree with you. If immigrants choose to come to the United States, they should abide by our laws that we have in place here. If they want to become a citizen, that is great. Becoming a citizen or living here legally allows certain rights and privileges (i.e. a driver's license). I don't believe a driver's license should be issued to someone who is not a legal resident of the United States. If people who are living in the U.S. illegally can obtain a driver's license, that is also proof that they are legal residents, which is false. In the spring of 2006 the U.S. House of Representatives passed legislation (HR4437) sponsored by Republican Representative James Sensenbrenner to make ‘‘unlawful presence’’ in the United States a felony. It defined unlawful presence so broadly that almost every immigration violation, no matter how minor, technical, or unintentional, became a federal crime subject to imprisonment and deportation. This goes along with what I have been indicating since reading this article. So in a sense are these states not allowing this felony to persist? Cut off their funding if they want to harbor Illegal immigrants. Obviously, if international students or legal immigrants are here legally they should be allowed licensure. I have a strong intolerance for people who prefer to jump through hoops. If you are here illegally you should be entirely focused on acquiring the proper documentation. I do not agree with licenses being given to illegal immigrants, at all. I think that the process for immigrants to get a driver' license should be somewhat in depth. They need to prove, like the article said, where they are living and certain other papers for proof. But on the other hand I think it is very hard if the qualification are made hard because not everyone might be able to find some certain specific papers due to the environment they were living in. The country they originally lived in might not be as organized as the US. The process for immigrants to get their driver's license should neither be too hard or too easy. If it is too easy than some criminals could make their way here and could cause the crime rate to go up and if it is too hard for them then they might even give up and not try anymore. Some immigrants are working hard and some are selling drugs but if you look at the real statistics about 80% of the drug sellers are doing it because they have nowhere else to go. Some people do it because they're family is in danger and they are being forced to do it, this happens a lot in the drug system so even though they do these things its not their choice its the other 20% that is actually doing these terrible acts. I think that immigrants should get all of the "legal" ways to obtain a license in this country. In America currently there are 11,000,000 illegal immigrants. These people are doing the jobs that Americans don't want to do. The tedious manual labor jobs that require a person to work a 12 hour day are the ones that should be able to obtain a license. Unfortunately not all of the illegal immigrants in this country are the hard working individuals that we are reading about. A lot are working for drug running cartels from Mexico, Columbia, and South America that bring drugs into the United States. Just because they are doing some of the jobs Americans don't want to do doesn't mean they should be here. If they are in the United States, they should become a legal resident if not a citizen. it is all part of a vicious cycled system... the imigrants can't get a driver's license because they are illegal in the country... so they (illegally) do the jobs americans don't want to do... however, the americans that hire them are taking advantage of the lack of choice the imigrants have, so they end up not paying them fairly enough... and the imigrant accepts the circunsances because it's just the smarter choice, considering that anything is better than going back to their native country. Although this is true, it is horrible that this happens in the United States. Americans should help these illegal immigrants become citizens, rather than hire them illegally. It may not ever happen, because it is much cheaper for them to employ people that won't cost as much money. You had indicated that 11 states have begun issuing licenses to immigrants who are here illegally. This to me is the most ridiculous thing I have ever read. For me the key word is "Illegally" If someone begins applying for a drivers license who is in our country illegally I would invest in tracking down where they live and work, punishing all those who assisted in harboring an illegal immigrant and then deport them. To me this is the only approach we should take when dealing with those who have entered our country illegally. We shouldn't be nurturing their beliefs that they are US Citizens by handing them out what it takes some US citizens months or years to achieve. In your first paragraph you had indicated that despite a long list of documents that an illegal immigrant may carry they are still considered "Undocumented". Now to me the problem isn't the fact that they do or don't have documents. The problem is that they are here illegally. Non-US Citizens working, living and breathing in our country illegally, they shouldn't be given rights in our country unless they are citizens. Deport any and all who apply for any type of benefit from our government, and if they are here illegally why should these 11 states harbor anything but. In fact, we could say that those allowing immigrants to achieve something that should only be achievable by US Citizens is in a sense is breaking a law, it should be no different than harboring a fugitive. Unless we are documenting them to deport them in the long run I do not see why they should be given access to rights of Americans. For those 11 states who are enacting these laws to pass, the government should step in and take away federal funding to these states. The problem is 'Illegal' immigrants, don't give them hope when they have entered our country by breaking our laws to begin with. Since when has enforcing bad behavior ever fixed a problem? I guess I do not keep up to date with a lot of political issues, to include illegal immigrants. At first I thought, "ah, this is a trap to deport illegal immigrants." But I guess that's not what the government does now? I guess I need to update myself on some political topics. California definitely needs to be careful, I can see how there lackadaisical requirements on documentation could be easily exploited. I do not understand what harm comes if an illegal immigrant gets a state ID that "contain a distinct marking and cannot be used as federal identification. "